Try for free the Operating System for PC (USB key or CD) or Raspberry Pi (SD). - Burn ISO image on a CD-ROM. - Write USB image on a USB key (2GB min). - Write SD image on a SD card (4Go min). - Copy NOOBS image files on a SD card (8Go min). 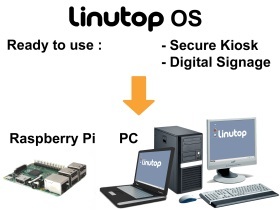 To start Linutop OS demo on a PC, BIOS must be configured to boot on the CD-ROM or USB key. Please fill up the form to be able to download the Free image file.